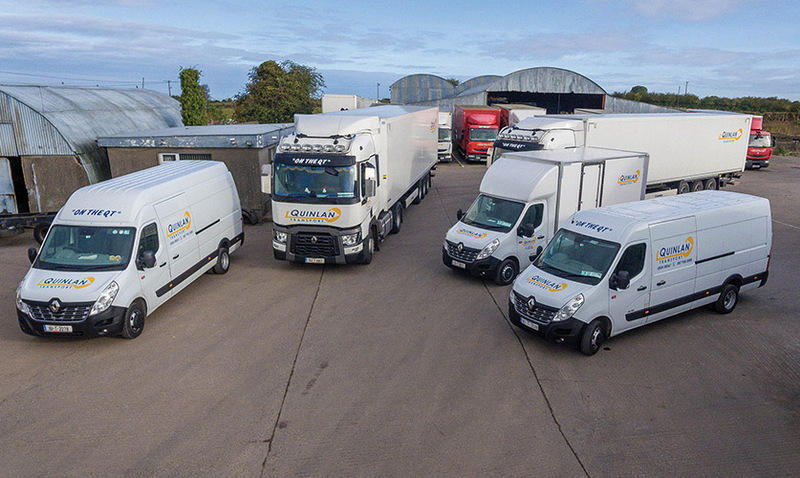 Quinlan Transport in Co Tipperary has established itself as a leader in the transportation of food products down south over the past quarter of a century. Irish Trucker learned more from company owner and founder Michael Quinlan. These are heady times for Quinlan Transport Ltd in Thurles, Co Tipperary and Managing Director Michael Quinlan wouldn’t have it any other way. Business is as busy as it has ever been for the family-run company and right now it’s about keeping up with the constant demand from their clients for whom they continue to deliver for time and time again. When Michael Quinlan first started his business more than 25 years ago, it was set-up with just a single van operating on the road. Today, Quinlan Transport runs a fleet of 24 trucks, between arctics and rigids, which are busy on Ireland’s roads all year round to satisfy customer demand. Michael was good enough to take time from what has become an increasingly busy schedule to tell Irish Trucker about his business and what they’ve been up to as of late down in the Premier County. “Our headquarters is situated at St John’s Park in Thurles which serves as a hub for our other depot’s which are located in Dublin, Galway and Letterkenny,”he outlined regarding the business which is established 25 years now. “We also have five vans working out of our secondary depot in Dublin which services all the major retailers. Both Mark and Roisin have followed their father into a business which has been thriving as of late. While the downturn affected companies nationwide, Quinlan Transport came through and is now at the point where it has had to add more trucks to its fleet in recent months. Michael opts for Renault when it comes to the trucks he puts on the road. Now with 24 vehicles delivering to bakeries all throughout the Munster region (and beyond), it’s a far cry from when Quinlan Transport’s MD first started out, as he explained himself. “Basically what we do is deliver bread and eggs to Aldi, Lidl and Dunnes Stores,”Michael outlined. In 2011, Quinlan Transport struck a deal to distribute goods for Armagh’s Irwin’s Bakery to help increase the company’s revenue considerably. The influx of extra business also helped the Thurles-based firm to navigate through the economic downturn successfully and now –some six years on –business is blossoming. “Business is very steady, I have to say. We’re doing bread and eggs which are a basic commodity that everyone needs, so we’re kept busy with it,”said the Managing Director. Johnston, Mooney & O’Brien is one of Ireland’s oldest companies, having been founded in 1835, also stands as the oldest bakery in the country. The brand has been synonymous with the best in baking tasty breads and morning goods every day for Irish families. Ireland’s oldest bakery also happens to be a trusted client of Quinlan Transport, which speaks volumes about the quality of service that the Thurles-based transport company provides its clientele. Michael believes that it’s this quality of service, aligned with timely deliveries, which sees Quinlan Transport’s customers continuing to choose them first ahead of other competitors in the transport industry. The demand from clients continues to increase too, with Michael having to add to his company’s fleet in the early part of 2017 to ensure that the up in demand was met. Michael doesn’t stray from the Renault brand when it comes to his trucks as it’s a product that he finds reliable and efficient. Before they know it down in Thurles, Quinlan Transport will be coming up on 30 years in business and, going on form, it’d be no surprise to see a few more trucks added to the fleet along with customers added to the list of clientele.